Located in the beautiful rural Arlington Valley, 1/8 mile south of Desert Rose Road lying east of Old US Highway 80. 10+ acres of prime horse property. Build your dream house and horse property, invest while the price is still reasonable. - Located east of Old US Highway 80, 1/8 mile south of Desert Rose Road. - Certified Flood Zone X (out of the 100-year flood plain), no building restrictions. - Water is delivered from Arlington Canal Company via new concrete ditch. 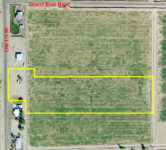 - There is a current lease on the irrigated acres, which can be terminated or continued, your choice! - Seller will consider selling in two 4.75 acre tracts; call for details.